As Donald Trump's 2016 presidential campaign phantasmagoria of existential horrors continues to churn its way towards an uncertain conclusion, we find ourselves once again in the unenviable position of having to judge the merits of one of his policy proposals. At a town hall event hosted by Fox News’ Sean Hannity, Trump was asked by an audience member what his plan was to reduce “black-on-black crime.” His answer? Expand the use of stop-and-frisk policies, the policing technique that until recently was a point of controversy in New York. The idea behind stop-and-frisk policing is that if an officer has a reasonable suspicion that someone on the street is engaged in some form of criminal activity, that cop can stop, question and search the person for weapons or other contraband. There’s a lot to pick apart here, but let’s start with the basic fact that Trump is wrong about stop-and-frisk policies' working in New York. It’s pretty well documented at this point that stop-and-frisk policies didn’t really do anything to lower violent crime in New York. The practice has been scaled back dramatically in New York over the past five years, with no attendant spike in crime rates. 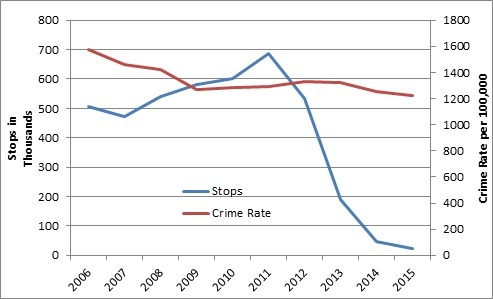 As the Brennan Center for Justice has pointed out, when the number of police stops in New York plunged after the 2011 peak of 685,000, the overall crime rate remained steady, and the murder rate declined sharply at the same time as the number of police stops was trailing off. After a judge ruled that New York’s stop-and-frisk procedures violated the rights of members of minority groups who were disproportionately targeted, the city implemented new guidelines to bring the practice within constitutional constraints. 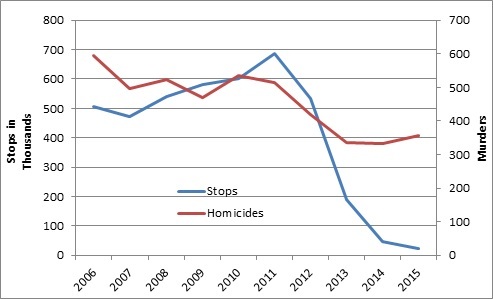 Meanwhile, police data showed that increases in police stops in Chicago did nothing to help prevent gun violence or solve murders. It turns out that he’s wrong on that score as well. Chicago implemented changes to its stop-and-frisk procedures after the Illinois ACLU threatened a lawsuit, resulting in a sharp decline in police stops beginning in October 2015. Since December 2015, the number of firearms recovered by police has been rising. Lastly, we have to circle back to the fact that Trump proposed stop-and-frisk policies as a means to reduce black-on-black crime — an idea that has the dubious distinction of being not just ineffective but also actively counterproductive. We’ve already seen that aggressive implementation of stop-and-frisk policies doesn’t help to reduce crime. It is, however, an effective way to promote and entrench feelings of alienation between law enforcement and minority communities.